I had this dish in my head for about a week. It came once again, from gluten-free cooking, and I really like polenta anyway! My favorite way to eat it is crispy fried on the outside. I thought it would be delicious Mexican style over beans, so here we are! I also got to take advantage of the Farmer's Market and I got heirloom tomatoes and bell peppers at a *very* reasonable price, which I am psyched about! Called "Peppered" because I have mild bell peppers, fried jalapenos, and chipotle (smoked jalapeno) powder. If you are going to make this, then do the polenta and marinate the tofu the day before. You may even do the salsa w/o the avocado and add it last minute. Don't be intimidated by the length of the recipe, it's just several simple components, and you can do it if I can! Keep polenta and tofu warm in the oven if you need to, while preparing the plates. Tofu Marinade- Wheat Free Soy sauce, brown sugar, sherry(or tequila/alcohol/lime juice), cumin, smoked paprika, chipotle powder, onion powder, water, vegetable oil. Adjust to taste. Water should be used only if marinade needs to be mellowed. Marinate an hour minimum (I like overnight). When ready to prepare, just saute in peanut or vegetable oil. Keep it simple. Heat water in a medium saucepan. Whisk in bouillon while heating and heat to boiling. *You can also use premade veggie broth or any other combo bouillon/water. I make mine weak for things like this. Whisk in polenta in a steady stream. Stir often. Add water if polenta becomes really thick. I did about 1/3 cup. Cover and turn heat down, cooking 15 min. Stir often. Add scallions/cilantro and olive oil/margarine and turn heat off. Stir once or twice while polenta cools for 10 minutes in pan. 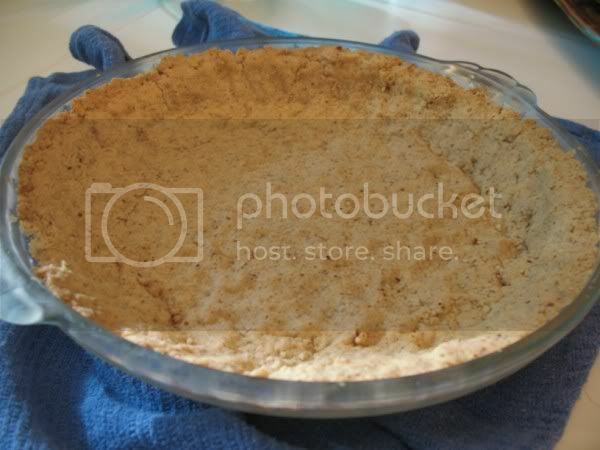 Pour into container and let come to room temperature, then refrigerate until completely firm all the way through. I would say 1 hour minimum in a shallow pan. From here you can cut into desired shape and fry until crispy on each side. Note: You can use the tubes of polenta that you find in the produce section. However, making it at home is way less expensive and the 20 min you put in can really impress because you added the cilantro and scallion flavor/color. I usually take refried beans (I have red refried beans, Frijoles Rojos Volteados, Natura's brand) and add stock, but I added a little extra this time. I fried up some red onions and garlic, then blended them with the stock so it would be completely smooth. General ratio is 1 c broth to 1-16oz can beans. I also add a hunk of margarine for flavor/fat since we are using lard-free. Add salt if necessary. These simmer on low for about an hour. Be careful and go slow, the mixture will blend eventually. 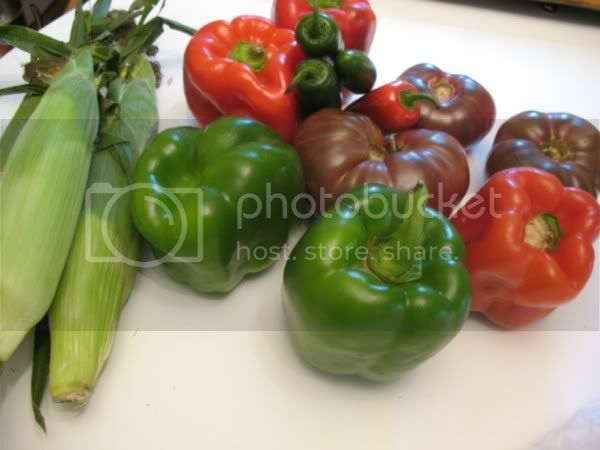 Roast 2 red and 2 green bell peppers. Put in a paper bag or plastic container with a lid and let cool. Skin and deseed. DO NOT rinse. Cut into strips to make sure each plate gets some of each pepper. To keep gluten free, use a GF flour like rice flour. Just chop fresh jalapeno to desired shape (I like strips because it doesn't include seeds), roll in flour, then soy buttermilk (soymilk plus a small amount apple cider vinegar), back in the rice flour and fry. These are for garnishing the top. This is optional but it's fun and pretty and quick. It also adds a punch if your peppers are hot! Do your thang! Chop those avocados and the mango, mix all ingredients except avocado. I pulsed in food processor. Fold in avocado so it keeps its structure. Corn is optional, but I like the mixture, and raw corn is really sweet and it ties into the corn in the polenta. 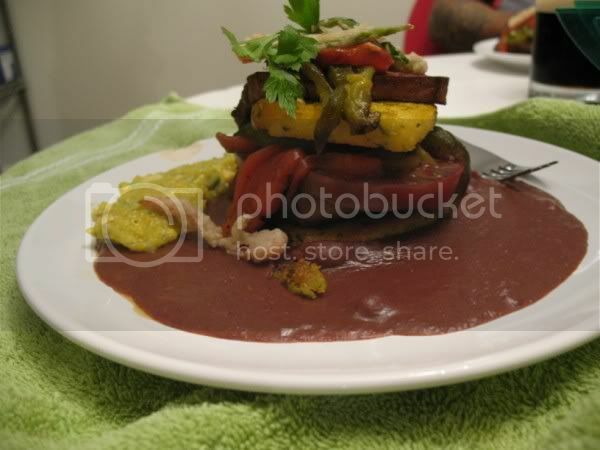 Beans on bottoms, polenta, tofu, tomato, roasted red peppers, polenta, tofu, roasted red peppers, fried jalapenos. My presentation was a little sloppy because we had 5 hungry tummies and I didn't want it to get cold! Thanks to the internet, I have a new ingredient in my kitchen- black salt. Read more! 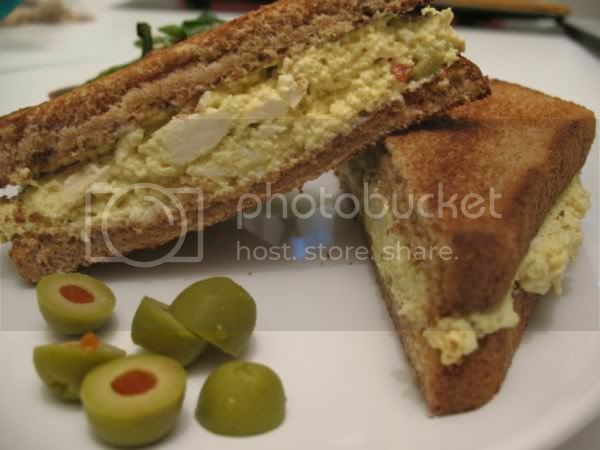 I've decided that "egg" salad is really subjective and it really depends on what type you had as a kid, if you had it at all. 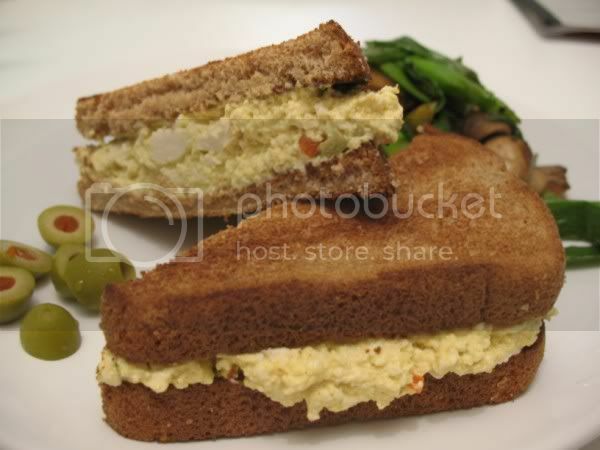 This recipe approximates my mom's egg salad. She likes green olives in it, so I grew up with that. I'm a big olive fan so that's great for me. (Funny enough, she doesn't like black olives!). The original recipe contains regular mayonnaise and a little Miracle Whip (the Miracle Whip is why there's a pinch of sugar). I subbed for Vegenaise and Spectrum vegan mayo, but I don't think it's a big deal to make it varied. If you do not like the smell/taste of eggs, do NOT make this recipe with the black salt. It will taste less eggy and more tofu salad-y if you sub regular salt for the black salt. Mash tofu in a bowl with a fork and add mayo and mustard. Mix. Sprinkle seasonings evenly over mixture and mix well. I ended up adding more mayonnaise. Make sure you crumble up the black salt. I noticed it sticks together so you don't want to bite into a chunk of it. Chill 1/2 hour at least to let flavors develop. Season extra to taste/color preference. I always had these in a sandwich. I'm going to be honest. I've never intentionally made a gluten free meal. I never "had" to. Well, we made a new friend, JL, and he is gluten-intolerant. Also lactose intolerant, which lucky for him is not an issue whatsoever in a vegan kitchen. I can relate now to people who try to cook for vegans and don't know what they are doing. As a cook, I view it as a challenge and a chance to get my feet wet, not a chore. I think as a vegan, I can sympathize. (Do they really have to put whey in an otherwise vegan cracker/soup/bread? Why is there gluten in almost all soy sauce?) I think instead of lamenting, we should COOK! And once you look into it, you may find foods you never knew you liked. If any GF vegans want to post resources in the comments section, feel free! I will share another secret. I totally made this crust up and hoped for the best. I feel it turned out well, and I would make it for a pie whether or not it was gluten free. It tasted like a mild shortbread, in my opinion. It could work for pumpkin pie, chocolate pie, etc. In a food processor, chop the almonds with the oats until fairly fine. I like a little texture. Add sugar and pulse. Then add flours. Cut the margarine into chunks and add. Process until even texture throughout. Mixture should hold when pressed together. If too dry, add a TINY amount of non-dairy milk or icewater. Bake 10-15 min in a 400 degree oven. Crust will not be very golden, so don't overcook. It's a little cake-y when hot, but when cooled it's like a crust should be. This picture is a 9-inch plate. If anyone wants to play with this recipe and report back, I'll post your findings and link to your blog if you have one. I think it would work fine with All Purpose Flour (would NOT be gluten free) and pecans. 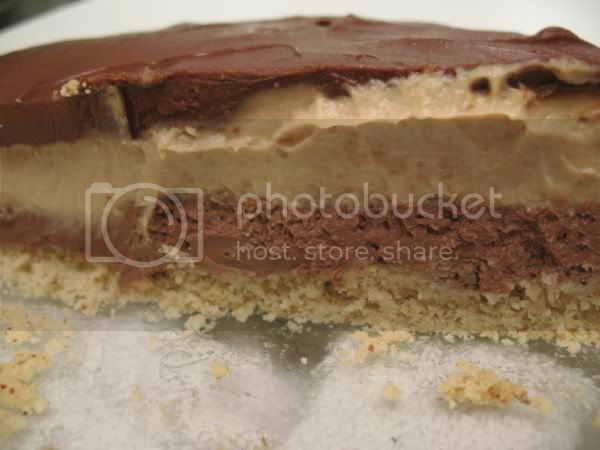 In case you were wondering, I made the VegNews chocolate peanut butter cup pie. If using extracts, make sure they are GF. Tones is definitely (it's on my bottle) and I am 99% sure McCormick is. Here is JL and Rocco (and my Kirby). Rocco is the dog on the left. He's 9 years old and very active and has a lot of zest! 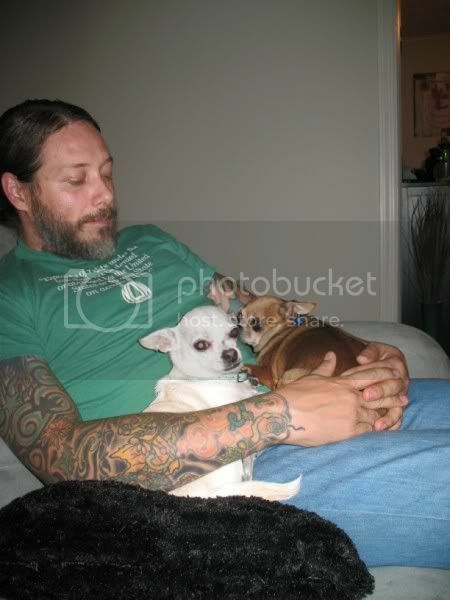 The dogs really like him! I will now be blogging from West NC! Most of the time I wouldn't dream of including a can of soup in a soup "recipe". It's too boxed-style for me. But we've been going out to eat every day and that's expensive and I just wanted something easy and quick. Heat skillet/pot and fry onion in a little vegetable oil until softened. Add garlic and chik'n strips and cook until strips are heated through and a bit firm. DO NOT let garlic burn. A couple min into cooking chik'n strips, put a good amount of curry powder and let it fry with the chicken. Add coconut milk and cook until it's basically coating the onion mixture, not too liquidy. Add can of coup and heat through.